The "Bremen Express" reached Tanger on Dec 23, 2016, at 1 p.m., and was moored on Tanger-Med-Aanchorage. The vessel was taken out from service and was to proceed to Rotterdam. 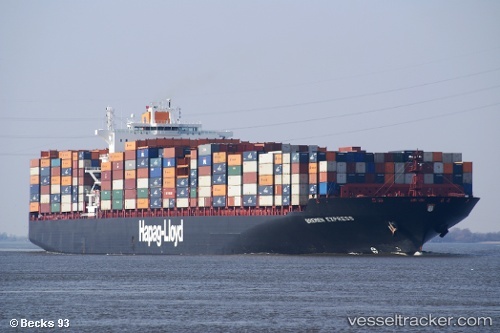 The container loss took place on Dec 19 in vicinity 35 05N 036 00W, some 510 nm southwest of Ponta Delgada, Azores, while en route from Norfolk to Jeddah. During a repair stop on Dec. 19 on the Atlantic, the “Bremen Express” (8,750 TEU) experienced rolling for reasons yet to be determined. As a result, some containers fell overboard. The ship, which operates in the CEC service and was located roughly 1,400 nautical miles west of Europe when the incident occurred, was and is not in danger. The 336-meter-long “Bremen Express,” built in 2008, was able to continue sailing after reporting the incident to the responsible authorities. It will call at a port in the Mediterranean in order to be inspected before passing through the Suez Canal on its journey to Asia. Ship is safe and continuing voyage. No persons injured. Causes to be investigated.